In her powerful and inspiring memoir, Cookie Johnson, wife of NBA legend Earvin “Magic” Johnson, shares details of her marriage, motherhood, faith, and how an HIV diagnosis twenty-five years ago changed the course of their lives forever. On November 7, 1991, basketball icon Earvin “Magic” Johnson stunned the world with the news that he was HIV-positive. For the millions who watched, his announcement became a pivotal moment not only for the nation, but for his family and wife. Twenty-five years later, Cookie Johnson shares her story and the emotional journey that started on that day—from life as a pregnant and joyous newlywed to one filled with the fear that her husband would die, that she and her baby would be infected with the virus, and that their family would be shunned. 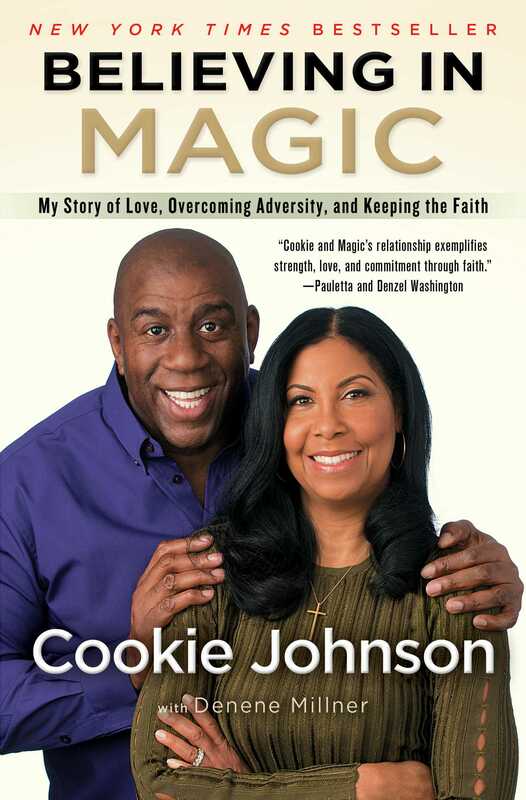 Believing in Magic is the story of Cookie’s marriage to Earvin—nearly four decades of loving each other, losing their way, and eventually finding a path they never imagined. Never before has Cookie shared her full account of the reasons she stayed and her life with Earvin “Magic” Johnson. Believing in Magic is her very personal story of survival and triumph as a wife, mother, and faith-filled woman. Cookie Johnson is a devoted philanthropist and, as Secretary of the Board of Directors for the Magic Johnson Foundation, a passionate spokesperson whose focus is on addressing the health, social, and educational needs of underserved communities. She joins her husband, Earvin “Magic” Johnson, in the fight against HIV/AIDS by spreading the word on ways to help reduce new HIV infections in underserved communities, educating minority women about the disease, and providing helpful tools for prevention and testing. The Michigan State University graduate lives with her husband in California; she is the mother to their three children, André, Earvin Johnson III (EJ), and Elisa. She is the author of Believing in Magic. "Believing in Magic is for real. A story about growing as an individual, a couple, and then as a family. Great adversity lead them to a challenging life, but being anchored by faith brought about the greatest love of all. Cookie and Magic have lived, loved, learned and now leave a great message for all. Have Faith." "Cookie and Magic’s relationship exemplifies strength, love, commitment through faith holding steadfast to the original design of marriage. We’re blessed to call them friends." "With humor and a God given sweet spirit, Cookie Johnson captures our attention. With humble sincerity and candor, she draws us into the heart wrenching story of her life with one of world's most famous athletes and powerful billionaire businessman. We are awed by the superior strength of her unwavering faith, as she determines to keep her loving family alive and together. Powerful and life affirming." – Rodney Peete & Holly Robinson Peete? "Some experiences we go through are made more difficult by fame and fortune. Believing in Magic is an example that one’s true treasure lies in faith, tenacity, and a sense of one’s own purpose in life." "In 1991, Cookie and Earvin (Magic) Johnson came to West Angeles Church amid a crisis greater than most couples ever experience. It has been an honor to know them, serve them, and love them and their family unconditionally as they have journeyed from then until now. We are convinced that this exciting and well-written story will touch and thrill the hearts of many for years to come." "Cookie has never been one to seek the spotlight and I'm thrilled that she is now sharing her story. Her beautifully written book will inspire and empower others to overcome any challenges in their lives. Cookie Johnson believes in Magic and I believe in her." "A poignant account of their time together. This book answers many of the why's of their relationship, but more importantly it shows Cookie's strength, tenacity, intelligence and sheer will to raise her family, live an authentic life and support her soulmate. A must read!"